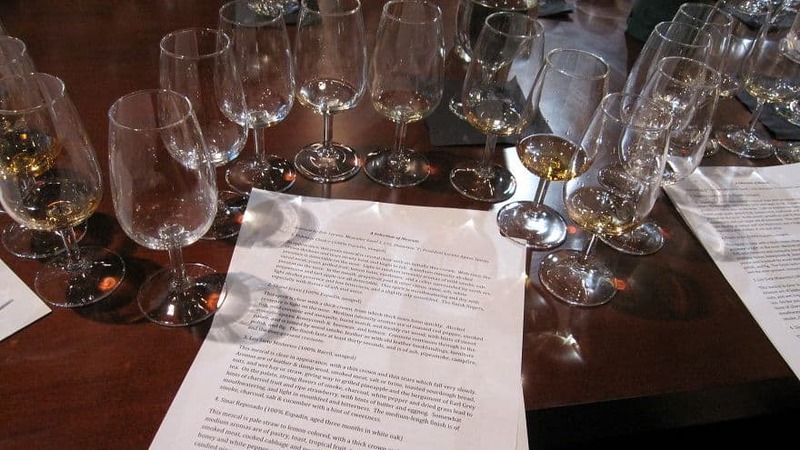 With all great varieties of liquor to be tasted at the Hopscotch Vancouver whiskey festival, who would have thought there was something new to discover beyond whiskey. Just before my Johnnie Walker whiskey tasting class, I got the chance to learn about the tradition that goes behind the production of the Mexican liquor, mezcal. Like a classier artisan-crafted version of tequila, the methods behind mezcal production creates a taste combination similar to smoking a fine Cuban cigar while eating sweet aged jerky. 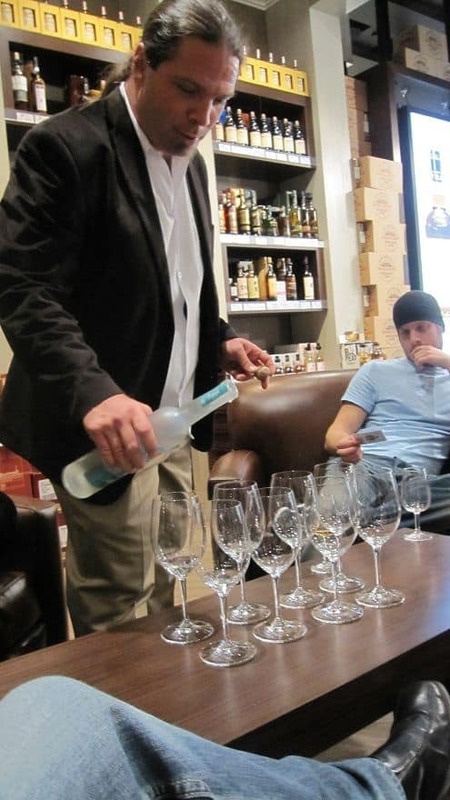 Luckily for me, I was under the influence of Spirits of Mexico 2010 judging panel member and front runner to becoming Canada’s tequila ambassador, Eric Lorenz of Lorenz Agave Spirts. Eric Lorenz, President of Lorenz Agave Spirits, offers a post-class discussion. Basically, all tequila is mezcal but not all mezcal is tequila. Tequila uses only the blue Weber agave plant while Mezcal uses up to 28 different agave plants. 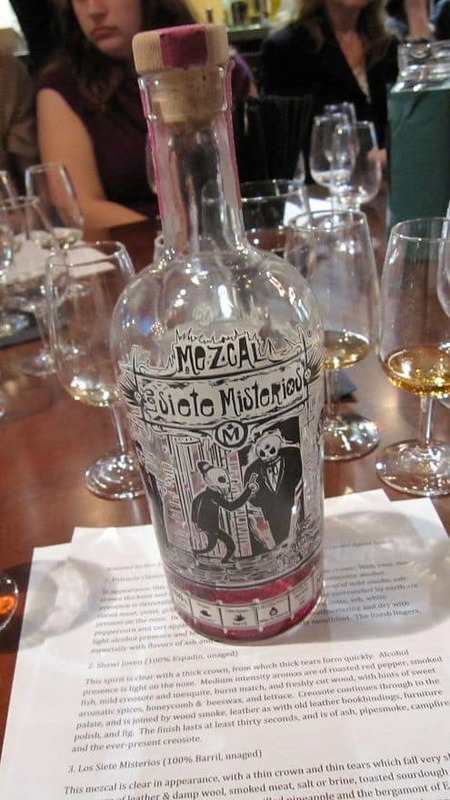 Mezcal is primarily made in Oaxaca. Tequila is primarily produced in the state of Jalisco, where the town of Tequila is located, but it could also be produced in other states considered “Tequila Region”. Mezcal is a hand crafted tradition, often passed down the generations. The blue agave used in tequila is always steamed. Mezcal producers roast the agave for about three days, often in pit ovens, which are earthen mounds over pits of hot rock. This gives mezcal a rich smoky flavor. 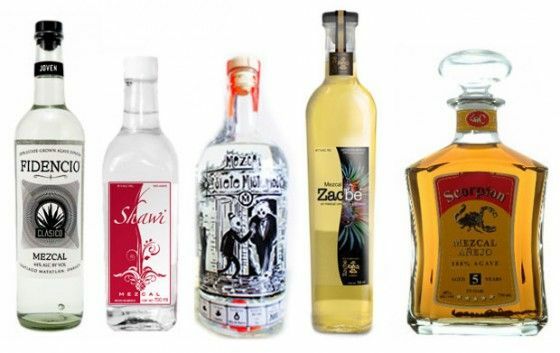 Mezcal could be aged the same way as tequila; Silver or Joven is freshly distilled and clear color, Reposado is rested in oak from 2-11 months; Anejo is aged 1 year or longer in oak. No chemicals are used in the production of Mezcal. Natural yeast from open aired vats is used in the fermentation process. Most industrial batches of Tequila use chemicals to quicken the fermentation. Los Siete Misterios. The real mystery is how you survived the drink, funny because the label has a drawing of it's willing participant knocking on the door of Death. Fidencio Clásico (100% Espadín, unaged) – A lasting impression for my introductory into the world mezcal. The ashy and salty meat taste was a formidable adversary for the instant tequilia like smell. Shawi Joven (100% Espadín, unaged) – This one had a roasted pepper/mesquite style to it. Actually, it was like I was licking an old leather jacket from thrift shop…doused in pepper spray. Los Siete Misterios (100% Barril, unaged) – Being distilled in traditional clay pots rather than the more common copper gave this brand it’s very unique smokey leather feature, like BBQ. In all, it’s very enjoyable novelty. Sinai Reposado (100% Espadín, aged 3 months in white oak) – This reminded me of what it would be like to drink a blend of a smoked meat sandwich and sweet fruit. Zacbe Reposado (100% Espadín, aged 3 months in American & French Oak, blended with 3 year aged) – You really notice the 3 months age in oak compared to the prior samples. The wood/smoke taste was a refreshing change with the added vanilla and cinnamon. But you really get that campfire taste in the back of your mouth. Scorpion Mezcal Añejo 5 Year (70% Espadín, 30% Barril, aged 5 years in American Oak) – A salty smoke tone with a sweet caramel, fruits, herbs with a strong flavor of vanilla, hazlenut, pepper, and wood-like features. Forget the worm when you can eat a real scorpion at the bottom of the bottle. After class, Eric stuck around gave us a bit of a background of his exploits as a recent academic turned Canadian tequila importer. It was only at this point that he introduced to us a blue agave liquor that can’t officially be called tequila because the region of origin (Mazatlan, Sinaloa) isn’t certified “Tequila Region”. 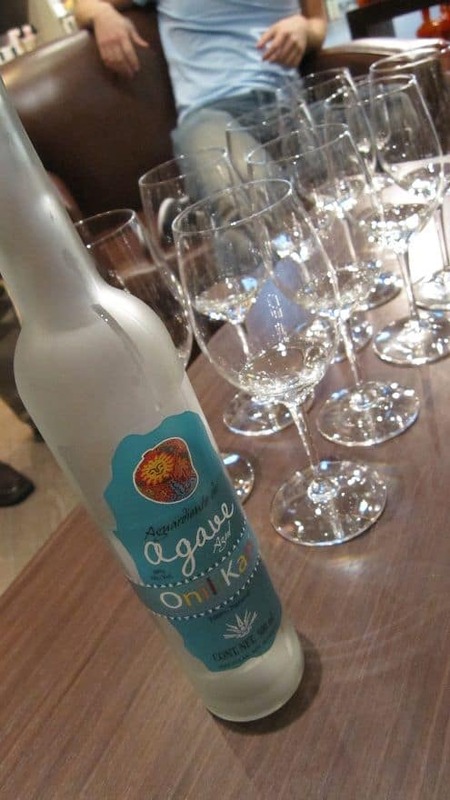 The Onilikan Agave Aguardiente (100% Blue Agave Aguardiente, 40% alcohol) is a sweet and smooth liquor that’s easy to take down on its own and probably very nice to mix. It contained a hint of a mild tone of cotton candy but it tasted more like a natural sweetness, not at all like how over sugary drinks make you feel after one too many. This same distillery also makes a mango liquor which I would love to get my hands on. It’s an shame we aren’t doing shots like this at the bar instead of tequila. Especially, if at the end of the night, it tasted like candy on the way back up. If there was an Unfinished Guy like there is an Old Spice Guy or the Most Interesting Man in the World, I would be him. Thanks A TON for writing this excellent article and letting Vancouver’s imbibing public know what they missed the other evening. I particularly liked how you highlighted the differences in the cooking processes between tequila and mezcal, as well as the diversity of agaves which may be used to produce mezcal. 1) Mezcal is required to be distilled twice, just like tequila. I hope I did not give the wrong impression! 2) An agave is actually only as similar to a cactus as a bird is to a butterfly. Both agaves and cacti have both evolved convergently similar metabolic pathways (both only open their pores at night to allow carbon dioxide to enter for their daytime use in photosynthesis) and defense mechanisms (agaves, cacti, and many desert shrubs and herbs have developed sharp spines and some have developed waxy skin coverings or woody exteriors to avoid being eaten). However, they are in fact, not even in the same subclass (much less order or family) – cacti are Dicotyledons and agave are Monocotyledons. Opps my mistake. Thanks Eric for the corrections! Of course, thanks again for such a great time. Keep us posted on any future events for us to attend!